Denise and Patty attend the same church here in Korea. Denise recently heard (from someone) that Patty has been badmouthing her behind her back. Denise is furious and wants to confront Patty ASAP. One Sunday before service, Denise accosts Patty. Denise (then) glares + shakes her fist at Patty. Many people are able to witness this. They wonder: “What could Patty have done to anger Denise like that?” The following day, Patty files a criminal complaint against Denise for the crime of “Insult” (모욕). Denise is indicted. How is a Korean court likely to decide? In a similar case, the Seoul Central District Court found Denise guilty. She received a criminal fine of KRW 300,000 (USD 265) for the above incident + a previous incident where she verbally insulted Patty in public. (A prison sentence for this crime alone is rare.) This was an appellate court decision. The trial court had also found her guilty. The crime of “Insult” can be perpetrated even through mere gestures/actions. It need not be perpetrated verbally or in writing. Denise’s actions were enough to satisfy the definition of “insult” under Article 311 of the Criminal Act. “Insult” refers to “expressing derogatory feelings or passing abstract judgments (via opinion) that are capable of harming another person’s social reputation” (Supreme Court Decision of November 28, 2003, 2003Do3972). Finally, the perpetrator can always try to invoke a defense saying it was “justifiable under the circumstances.” (More on this in Part IV.) In this case, the court did not feel Denise’s actions/gestures were. Guru Note 2: Here, Patty can also file a civil suit against Denise for “psychological pain and suffering.” Had Denise been able to settle with Patty, Patty would have dropped the criminal complaint (i.e., criminal case closed), and a lawsuit would no longer be an option either. The settlement amount would probably have been around 1-2 million won. – Alternate Reality A: Had Denise brandished scissors (instead of her fist), that could constitute the crime of “Intimidation” (협박). – Alternate Reality B: Had Denise touched (with her fist) Patty’s glasses, causing them to fall, that could constitute the crime of “Violence” (폭행). 1. a) The most common form of this crime (right now) is online name-calling. FYI, there is no separate “cyber” form of this crime, so Article 311 applies to both online/offline insults. b) The legal threshold for “Insult” is shockingly easy to satisfy. For example, publicly calling or implying another person to be a “douchebag” would easily qualify. 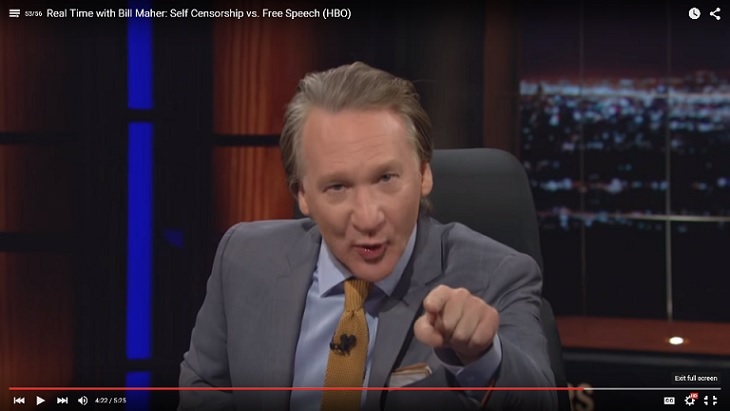 Hurling invective, racial slurs: most definitely. c) The perpetrator need not know the actual name of the person he/she is insulting. The insult just needs to be clearly directed at someone. For instance, insult directed at a specific online username or in-game character would pass muster. But FYI: Unlike defamation crimes, the crime of insult cannot be perpetrated against a group of people. A specific person has to be targeted. 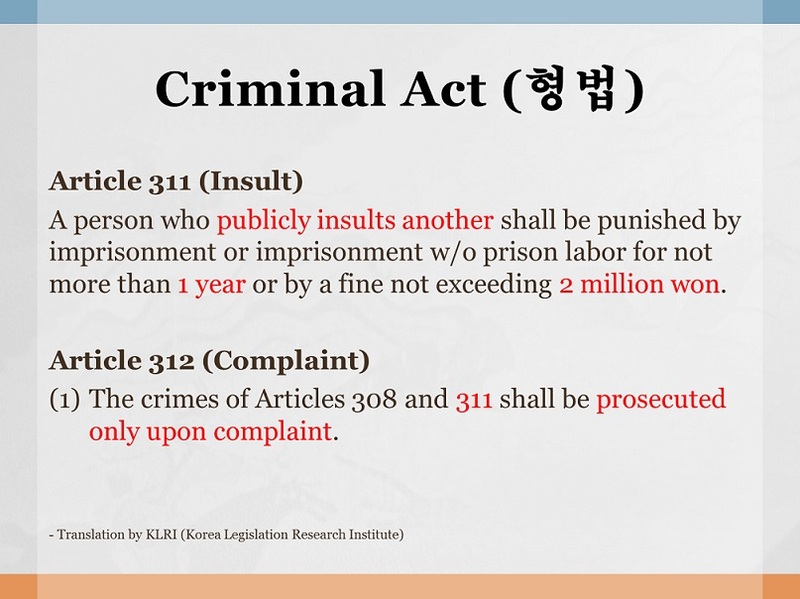 3. a) In order to prosecute a person for this crime, a criminal complaint (고소) is required. This means the police/prosecutor will not just go out of their busy way to investigate this crime. b) The “victim” must not only file a criminal complaint but also submit at least some evidence to back that up (e.g., a witness, a screenshot). FYI, you do not need a lawyer to file a criminal complaint. c) To successfully file a criminal complaint, make sure: 1) the insult was made in public, and 2) it’s clear you were intended to be on the receiving end. Oh, try not to insult back; that could hurt your chances too. But the more important question might be: Would it be worth your time and effort? Is the juice worth the squeeze. 4. Publicly insulting another person is not always a crime. It can sometimes be “justified under the circumstances.” In law, we say “circumstances precluding wrongfulness.” For example: 1) You were severely provoked by that person, or 2) That person impeded you as you were exercising your rights, or 3) The insult can be considered negligible in relation to the overall point. But there isn’t one formula that covers all possibilities. Each case needs to be looked at in its own context. DID YOU KNOW? So, the following type of music video would not be possible in Korea. It’s a parody of the 1993 hit song “Informer” by Snow. “The scope of elements of ‘insult’ in the Provision that constitute a crime is excessively broad, and negative or derogatory expressions against a person amount to insult as they are likely to undermine one’s social reputation. In the same vein, not just hateful cursing of someone humiliating enough to tear down his/her character, but satirical, humorous literary expressions that use ridicule to expose and criticize the world, twisted and negative intentions taking the form of polite expressions, newly coined words on the Internet that are somewhat violent, etc. are also punishable as a crime of insult. Consequently, even the expressions that warrant the protection of the Constitution can be regulated. Criminal punishment of insult limits the possibility of raising issues in social communities and addressing them constructively through free exchange of different views and criticism. If some negative languages or critical expressions on sensitive political, social issues used in political, academic debates or communications are considered insult and regulated accordingly, political and academic statements will be threatened and the possibility of open debates will be restrained, weakening the essential function of the freedom of expression. Above is just the dissenting opinion. To read the full text, click here. If you read the full text, you can find out about why the remaining 5 Justices found Article 311 constitutional. For me, the simplest argument is that freedom of expression should not come at another’s expense. But the retort could be: “Should you be left with a criminal record for that?” If the victim is really intent on seeing you convicted (as opposed to “cashing out” via settlement), you can/will be left with a criminal record. 6. Recent Controversies #1: 10 individuals were recently indicted (by the Daegu District Prosecutors’ Office) for having publicly insulted a woman who had given a false interview during the Sewol Ferry Disaster. Backstory: During the Disaster in April 2014, a woman (who claimed to be a civilian rescue diver) gave an interview on live television that the maritime police were hindering their rescue efforts and that a diver even heard voices coming from inside the drowned ship. Well, it was later revealed she wasn’t even a diver. 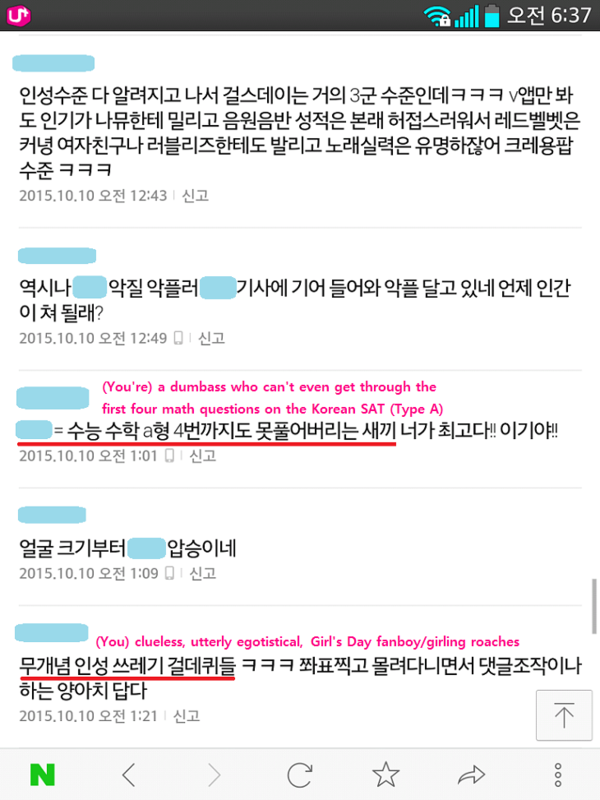 Some Koreans became angry and left harsh, spiteful comments about her online. To this, she decided to file criminal complaints against them all. More than 1,500 of them! (Hers was “why do it when you can overdo it” kind of deal.) As criticism arose, the Supreme Prosecutors’ Office announced at one point they would only indict the most egregious offenders (e.g., repeat offenders). Hence only the 10 indicted. Those 10 were out of 515 individuals the Daegu District Prosecutors’ Office was handling. Yes, many were spared, but some were unindictable only because they had reached a monetary settlement with the woman. Reports say, 75 had reached a settlement suspected to be around 2-10 million won (per). This is not the end either. The Daegu District Prosecutors’ Office was handling just 515 out of the more than 1,500 nationwide. So, expect more news to come. DID YOU KNOW? The number of criminal complaints filed for “Insult” rose from 2,225 in 2004 to 27,945 in 2014. This is more than tenfold. DID YOU KNOW? A person found guilty of “Insult” usually receives a criminal fine. In practice, KRW 300,000 seems to be the minimum. 7. Recent Controversies #2: In November 2014, the National Human Rights Commission of Korea urged the police to come up with measures to make sure police arrest procedures are implemented lawfully. In April 2015, the Korean National Police Agency came up with new guidelines on how to handle such “Insult” cases. The new guidelines specifically outline two instances where warrantless arrests (for “Insult” to a police officer) are to be implemented: 1) The insulter refuses to identify him/herself, or 2) it’s difficult to acquire witnesses. DID YOU KNOW? Earlier this year, India’s highest court ruled as unconstitutional a law criminalizing “offensive” online posts. To watch the full segment, click here. Thanks for reading!